For the biology usage, see Naturalisation (biology) and Invasive species. Naturalization (or naturalisation) is the legal act or process by which a non-citizen in a country may acquire citizenship or nationality of that country. It may be done automatically by a statute, i.e., without any effort on the part of the individual, or it may involve an application or a motion and approval by legal authorities. The rules of naturalization vary from country to country but typically include a promise to obeying and upholding that country's laws, taking and subscribing to the oath of allegiance, and may specify other requirements such as a minimum legal residency and adequate knowledge of the national dominant language or culture. To counter multiple citizenship, most countries require that applicants for naturalization renounce any other citizenship that they currently hold, but whether this renunciation actually causes loss of original citizenship, as seen by the host country and by the original country, will depend on the laws of the countries involved. The massive increase in population flux due to globalization and the sharp increase in the numbers of refugees following World War I created a large number of stateless persons, people who were not citizens of any state. In some rare cases, laws for mass naturalization were passed. As naturalization laws had been designed to cater for the relatively few people who had voluntarily moved from one country to another (expatriates), many western democracies were not ready to naturalize large numbers of people. This included the massive influx of stateless people which followed massive denationalizations and the expulsion of ethnic minorities from newly created nation states in the first part of the 20th century, but they also included the mostly aristocratic Russians who had escaped the 1917 October Revolution and the war communism period, and then the Spanish refugees. As Hannah Arendt pointed out, internment camps became the "only nation" of such stateless people, since they were often considered "undesirable" and were stuck in an illegal situation, wherein their country had expelled them or deprived them of their nationality, while they had not been naturalized, thus living in a judicial no man's land. Since World War II, the increase in international migrations created a new category of migrants, most of them economic migrants. For economic, political, humanitarian and pragmatic reasons, many states passed laws allowing a person to acquire their citizenship after birth, such as by marriage to a national – jus matrimonii – or by having ancestors who are nationals of that country, in order to reduce the scope of this category. However, in some countries this system still maintains a large part of the immigrant population in an illegal status, albeit with some massive regularizations, for example, in Spain by José Luis Zapatero's government and in Italy by Berlusconi's government. The People's Republic of China gives citizenship to persons with one or two parents with Chinese nationality who have not taken residence in other countries. The country also gives citizenship to people born on its territory to stateless people who have settled there. Furthermore, individuals may apply for nationality if they have a near relative with Chinese nationality, if they have settled in China, or if they present another legitimate reason. In practice, only few people gain Chinese citizenship; as of 2010, China had only 1,448 naturalised Chinese in total. The naturalization process starts with a written application. Applicants must submit three copies, written with a ball-point or fountain pen, to national authorities, and to provincial authorities in the Ministry of Public Security and the Public Security Bureau. Applicants must also submit original copies of a foreign passport, a residence permit, a permanent residence permit, and four two-and-a-half inch long pictures. According to the conditions outlined in the Nationality Law of the People's Republic of China, authorities may also require "any other material that the authority believes are related to the nationality application". The Indian citizenship and nationality law and the Constitution of India provides single citizenship for the entire country. The provisions relating to citizenship at the commencement of the Constitution are contained in Articles 5 to 11 in Part II of the Constitution of India. Relevant Indian legislation is the Citizenship Act 1955, which has been amended by the Citizenship (Amendment) Act 1986, the Citizenship (Amendment) Act 1992, the Citizenship (Amendment) Act 2003, and the Citizenship (Amendment) Ordinance 2005. The Citizenship (Amendment) Act 2003 received the assent of the President of India on 7 January 2004 and came into force on 3 December 2004. The Citizenship (Amendment) Ordinance 2005 was promulgated by the President of India and came into force on 28 June 2005. Following these reforms, Indian nationality law largely follows the jus sanguinis (citizenship by right of blood) as opposed to the jus soli (citizenship by right of birth within the territory). The Italian Government grants Italian citizenship for the following reasons. To obtain or re-obtain from a parent. By naturalization: the foreigner can apply for Italian citizenship after ten years of legal residence in Italy, reduced to five years for those who have been recognized as stateless or refugee and four years for citizens of countries of the European Community. Indonesian nationality is regulated by Law No. 12/2006 (UU No. 12 Tahun 2006). The Indonesian nationality law is based on jus sanguinis and jus soli. The Indonesian nationality law does not recognize dual citizenship except for persons under the age of 18 (single citizenship principle). After reaching 18 years of age individuals are forced to choose one citizenship (limited double citizenship principle). Any application for citizenship is granted by the President of Indonesia. Israel's Declaration of Independence was made on 14 May 1948, the day before the British Mandate was due to expire as a result of the United Nations Partition Plan. The Israeli parliament created two laws regarding immigration, citizenship and naturalization: the Law of Return and the Israeli nationality law. The Law of Return, enacted on July 15, 1950, gives Jews living anywhere in the world the right to immigrate to Israel. This right to immigrate did not and still does not grant citizenship. In fact, for four years after Israel gained independence, there were no Israeli citizens. On July 14, 1952, the Israeli parliament enacted the Israeli Nationality Law. The Nationality Law naturalized all citizens of Mandated Palestine, the inhabitants of Israel on July 15, 1952, and those who had legally resided in Israel between May 14, 1948, and July 14, 1952. The law further clarified that naturalization was available to immigrants who had arrived before Israel's creation, immigrants who arrived after statehood was granted, and those who did not come to Israel as immigrants but have since expressed desire to settle in Israel, with restriction. Naturalization applicants must also meet the following requirements: be over 18 years of age, have resided in Israel for three out of the five preceding years, have settled or intend to settle permanently in Israel, have some knowledge of Hebrew, and have renounced prior nationality or demonstrated ability to renounce nationality after becoming a citizen of Israel. Because of Israel's relatively new and culturally mixed identity, Israel does not grant citizenship to persons born on Israeli soil. Instead, the government chose to enact a jus sanguinis system, with the naturalization restrictions listed above. There is currently no legislation on second-generation immigrants (those born in Israel to immigrant parents). Furthermore, foreign spouses can apply for citizenship through the Minister of the Interior, but have a variety of restrictions and are not guaranteed citizenship. Naturalisation in Malaysia is guided by the 1964 Malaysian Constitution. According to the law, those who want to be the country citizen should live in the country for a period of 10–12 years. The would-be-citizens are required to speak the Malay language as well submitting the identity cards of two Malaysians who recommend the applicant for citizenship. As the Government of Malaysia does not recognise dual citizenship, those who seek naturalisation are needed to reside permanently in the country and renouncing their former country citizenship. The applicant must be aged 21 years and above on the date of the application. The applicant has resided in the federation for a period of not less than 10 years in a period of 12 years, including the 12 months immediately preceding the date of application. The applicant has adequate knowledge of the Malay language. The applicant must be sponsored by two referees who are citizens aged 21 years and above and who are not relatives, not hired persons, and not advocates or solicitors to the applicant. Form C must be completed and submitted together with copies of the necessary documents. The Article 16 of 1957 Malaysian Constitution also stated a similar condition previously. Commonwealth Act No. 473, the Revised Naturalization Law, approved June 17, 1939, provided that persons having certain specified qualifications may become a citizen of the Philippines by naturalization. Republic Act No. 9139, approved June 8, 2001, provided that aliens under the age of 18 who were born in the Philippines, who have resided in the Philippines and have resided therein since birth, and who possess other specified qualifications may be granted Philippines citizenship by administrative proceeding subject to certain requirements. Naturalization in Russia is guided by articles 13 and 14 of the federal law “About Citizenship of Russian Federation” passed on May 31, 2002. Citizenship of Russia can be obtained in general or simplified order. To become a citizen in general order, one must be 18 years of age or older, continuously live in Russia as a permanent resident for at least five years (this term is limited to one year for valued specialists, political asylum seekers and refugees), have legal means of existence, promise to obey the laws and Constitution of Russia and be fluent in the Russian language. There is also a possibility to naturalize in a simplified order, in which certain requirements will be waived. Eligible for that are persons, at least one parent of whom is a Russian citizen living on Russian territory; persons, who lived on the territories of the former Soviet republics but never obtained citizenships of those nations after they gained independence; persons, who were born on the territory of RSFSR and formerly held Soviet citizenship; persons married to Russian citizens for at least 3 years; persons, who served in Russian Armed Forces under contract for at least 3 years; parents of mentally incapacitated children over 18 who are Russian citizens; participants of the State Program for Assisting Compatriots Residing Abroad; and some other categories. Chapter 2 of the South African Citizenship Act, enacted on October 6, 1995, defines who is considered a naturalized citizen at the time of the act and also outlines the naturalization process for future immigrants. Any person who immediately prior to the commencement of the act had been a South African citizen via naturalization, had been deemed to be a South African citizen by registration, or had been a citizen via naturalization of any of the former states now composing South Africa is now considered to be a naturalized citizen of South Africa. Those wishing to apply for naturalization in the future must apply to the Minister of Home Affairs and must meet a slew of requirements. First, naturalization applicants must be over the age of 18 and must have been a permanent resident of South Africa for one year prior to application and for four out of the eight years prior to application. Applicants must also demonstrate good character and knowledge of the basic responsibilities and privileges of a South African citizen. The ability to communicate in one of the official languages of South Africa is also required. Applicants must show the intention to reside in South Africa after naturalization, and they are required to make a declaration of allegiance.According to Article 3, subsection 3 of the South African constitution, national legislation must provide for the acquisition, loss and restoration of citizenship. Being a naturalized South African citizen is a privilege, not a right. Even after meeting all the requirements and going through the naturalization process, the minister holds the right to deny citizenship. Foreign spouses of South African citizens can apply for naturalization after two years of marriage, but is subject to potential denial of the minister. The minister can also grant citizenship to minors, if their parent applies for them. The minister also holds the power to revoke naturalization at any time for specific reasons listed in the Act. Reasons for revoking the naturalization certificate include marrying someone who is a citizen of another country and holding citizenship in another country, or applying for citizenship of another country without prior authorization for retention of citizenship. If a permanent resident is denied naturalization, he or she must wait at least one year before reapplying. been outside of the UK no more than 90 days during the one-year period prior to filing the application. show sufficient knowledge of life in the UK, either by passing the Life in the United Kingdom test or by attending combined English language and citizenship classes. Proof of this must be supplied with one's application for naturalisation. Those aged 65 or over may be able to claim exemption. meet specified English, Welsh or Scottish Gaelic language competence standards. Those who pass the Life in the UK test are deemed to meet English language requirements. the same language and knowledge of life in the UK standards apply as for those married to British citizens. "The sole authority to naturalize persons as citizens of the United States is conferred upon the Attorney General." In particular cases, however, federal judges may enjoin the Attorney General to confer U.S. nationality upon a person. The term "Attorney General" in the Immigration and Nationality Act (INA) includes any immigration judge or member of the Board of Immigration Appeals (BIA). The Naturalization Act of 1795 set the initial rules on naturalization: "free, White persons" who had been resident for five years or more. An 1862 law allowed honorably discharged Army veterans of any war to petition for naturalization after only one year of residence in the United States. An 1894 law extended the same privilege to honorably discharged five-year veterans of the Navy or Marine Corps. Laws enacted in 1919, 1926, 1940, and 1952 continued preferential treatment provisions for veterans. Following the Spanish–American War in 1898, Philippine citizens were classified as U.S. nationals, and the 1917 Jones–Shafroth Act granted U.S. citizenship to natives of Puerto Rico. But the 1934 Tydings–McDuffie Act reclassified Filipinos as aliens, and set a quota of 50 immigrants per year, and otherwise applying the Immigration Act of 1924 to them. The Magnuson Act repealed the Chinese Exclusion Act. During the 1940s, 100 annual immigrants from British India and the Philippines were allowed. The War Brides Act of 1945 permitted soldiers to bring back their foreign wives and established precedent in naturalization through marriage. The Immigration Act of 1965 finally allowed people from all nations to be given equal access to immigration and naturalization. Illegal immigration became a major issue in the United States at the end of the 20th century. The Immigration Reform and Control Act of 1986, while tightening border controls, also provided the opportunity of naturalization for illegal aliens who had been in the country for at least four years. Today, lawful permanent residents of the United States are eligible to apply for U.S. citizenship after five years, unless they continue to be married to a U.S. citizen, in which case they can apply after only three years of permanent residency. The following list is a brief summary of the duration of legal residence before a national of a foreign state, without any cultural, historical, or marriage ties or connections to the state in question, can request citizenship under that state's naturalization laws. Thailand 5 years No Continuous residence, The applicant must have knowledge of the Thai language. A few rare mass naturalization processes have been implemented by nation states. In 1891, Brazil granted naturalization to all aliens living in the country. In 1922, Greece massively naturalized all the Greek refugees coming back from Turkey. The second massive naturalization process was in favor of Armenian refugees coming from Turkey, who went to Syria, Lebanon or other former Ottoman countries. Reciprocally, Turkey massively naturalized the refugees of Turkish descent or other ethnic backgrounds in Muslim creed from these countries during a redemption process. Canada instituted a mass naturalization by Act of Parliament with the enactment of the Canadian Citizenship Act 1946. After annexation of the territories east of the Curzon line by the Soviet Union in 1945, Soviets naturalized en masse all the inhabitants of those territories—including ethnic Poles, as well as its other citizens who had been deported into the Soviet Union, mainly to Kazakhstan. Those persons were forcibly naturalized as Soviet citizens. Later on, Germany granted to the ethnic German population in Russia and Kazakhstan full citizenship rights. Poland has a limited repatriation program in place. The most recent massive naturalization case resulted from the Argentine economic crisis in the beginning of the 21st century. Existing or slightly updated right of return laws in Spain and Italy allowed many of their diasporic descendants to obtain—in many cases to regain—naturalization in virtue of jus sanguinis, as in the Greek case. Hence, many Argentines acquired European nationality. Since the Fourteenth Amendment to the United States Constitution grants citizenship only to those "born or naturalized in the United States, and subject to the jurisdiction thereof", and the original United States Constitution only grants Congress the power of naturalization, it could be argued that all acts of Congress that expand the right of citizenship are cases of mass naturalization. This includes the acts that extended U.S. citizenship to citizens of Puerto Rico, the United States Virgin Islands, Guam, and the Northern Mariana Islands, as well as the Indian Citizenship Act of 1924 which made all Native Americans citizens (most of them were previously excluded under the "jurisdiction" clause of the 14th Amendment). In the eastern Malaysian state of Sabah, mass naturalisation also happened during the administration of United Sabah National Organisation (USNO) and Sabah People's United Front (BERJAYA's) Muslim-dominated political parties to increase the Muslim population in the territory by naturalising immigrants and refugees from the mainly-Muslim dominated areas of Mindanao and Sulu Archipelago of the Philippines and Sulawesi of Indonesia. The mass naturalization of native persons in occupied territories is illegal under the laws of war (Hague and Geneva Conventions). However, there have been many instances of such illegal mass naturalizations in the 20th century. Denaturalization is the reverse of naturalization, when a state deprives one of its citizens of his or her citizenship. From the point of view of the individual, denaturalization means revocation or loss of citizenship. Denaturalization can be based on various legal justifications. The most severe form is the "stripping of citizenship" when denaturalization takes place as a penalty for actions considered criminal by the state, often only indirectly related to nationality, for instance for having served in a foreign military. In countries that enforce single citizenship, voluntary naturalization in another country will lead to an automatic loss of the original citizenship; the language of the law often refers to such cases as "giving up one's citizenship" or (implicit) renunciation of citizenship. In another case, affecting only foreign-born citizens, denaturalization can refer to the loss of citizenship by an annulment of naturalization, also known as "administrative denaturalization" where the original act of naturalization is found to be invalid, for instance due to an administrative error or if it had been based on fraud (including bribery). In the US, the Bancroft Treaties in the 19th century regulated legislation concerning denaturalization. In 2010, the U.S. government launched a program (Operation Janus) “to prevent aliens who received a final removal order under a different identity from obtaining immigration benefits”. In January 2018, for the first time, a denaturalization was performed as a result of this program, and a further program (Operation Second Look) was initiated by the HSI specifically to address leads received from Operation Janus. In June 2018, UCSIS announced an increase of the efforts to detect fraudulent naturalization cases, aiming at the revocation of the citizenship of individuals who had applied under false pretense. In the United States, the proposed, but never ratified, Titles of Nobility amendment of 1810 would revoke the American citizenship of anyone who would "accept, claim, receive or retain, any title of nobility" or who would receive any gifts or honors from a foreign power. Before World War I, only a small number of countries had laws governing denaturalization that could be enforced against citizens guilty of "lacking patriotism". Such denaturalized citizens became stateless persons. During and after the war, most European countries passed amendments to revoke naturalization. It is important to note that starting with the period of World War I, many European states began to introduce laws which permitted their own citizens to be denaturalized and denationalized. The first was France, in 1915, with regard to naturalized citizens of "enemy" origins; in 1922 the example was followed by Belgium, which revoked the naturalization of citizens who had committed "anti-national" acts during the war; in 1926 the Fascist regime in Italy passed a similar law concerning citizens who had shown themselves to be "unworthy of Italian citizenship"; in 1933 it was Austria's turn, and so forth, until in 1935 the Nuremberg Laws divided German citizens into full citizens and citizens without political rights. 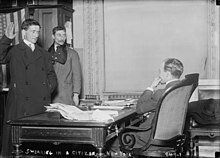 These laws—and the mass statelessness that ensued—mark a decisive turning point in the life of the modern nation-state and its definitive emancipation from the naive notions of "people" and "citizen"
The 1915 French denaturalization law applied only to naturalized citizens with "enemy origins" who had kept their original nationality. Later under Raymond Poincaré's government, another law was passed in 1927 which entitled the government to denaturalize any new citizen who committed acts contrary to the national interest. In 1916, Portugal passed a law which automatically denaturalized all citizens born to a German father. In 1922, Belgium enacted a law revoking the naturalization of persons accused of having committed "antinational acts" during the war; this was supplemented in 1934 by a new decree against people "in dereliction of their duties as Belgian citizens." After 1926 in Italy, people who were deemed not to deserve the Italian citizenship or who were considered to represent a threat to the public order could lose their naturalization. Egypt in 1926 and Turkey in 1928 enacted laws authorizing denaturalization of any person threatening the public order. Austria passed a similar law in 1933 by which it could denaturalize any citizen who participated in a hostile action against the state. Russia also passed several similar decrees after 1921. In 1933, Nazi Germany passed a law authorizing it to denaturalize any person "living abroad" and began restricting the citizenship rights of naturalized citizens of Jewish origin, followed in 1935 by citizens by birth on the basis of the Nuremberg laws. During Vichy France, 15,000 persons, mostly Jews, were denaturalized (between June 1940 and August 1944), following the setting up, in July 1940, of a Commission charged of revision of naturalizations since the 1927 reform of the nationality law. Loss of U.S. citizenship was a consequence of foreign military service based on Section 349(a)(3) of the Immigration and Nationality Act until its provisions were found unconstitutional by the Supreme Court in 1967 in Afroyim v. Rusk. Yaser Esam Hamdi was a U.S. citizen captured in Afghanistan in 2001. He was fighting against U.S. and Afghan Northern Alliance forces, siding with the Taliban. He was named by the Bush administration as an illegal enemy combatant, and militarily detained in the country for almost three years without receiving any charges. On September 23, 2004, the U.S. Justice Department agreed to release Hamdi to Saudi Arabia on the condition that he give up his U.S. citizenship, though since it was done under duress it is possible that he can later reclaim it. Section 4 of the British Nationality, Immigration and Asylum Act 2002 gave power to the Home Secretary to ‘deprive a person of a citizenship status if the Secretary of State is satisfied that the person has done anything seriously prejudicial to the vital interests’ of the United Kingdom etc., except in the case where such might render the person stateless. Those who are revoked can appeal to the Federal Court of Canada. In Apartheid-era South Africa, the Bantu Homelands Citizenship Act, 1970, removed South African citizenship from Black South Africans, making them citizens of nominally-independent or self-governing tribal "homelands", the Bantustans — none of which achieved international recognition. In parallel with the creation of the homelands, South Africa's black population was subjected to a massive programme of forced relocation. It has been estimated that 3.5 million people were forced from their homes from the 1960s through the 1980s, many being resettled in the Bantustans. With the demise of the apartheid regime in South Africa in 1994, the Bantustans were dismantled and their territory reincorporated into the Republic of South Africa. The drive to achieve this was spearheaded by the African National Congress as a central element of its programme of reform. The Bantu Homelands Citizenship Act itself was repealed by the 1993 Interim Constitution, with all citizens being restored to their South African citizenship. ^ a b c 8 U.S.C. § 1101(a)(23) ("The term 'naturalization' means the conferring of nationality of a state upon a person after birth, by any means whatsoever. "); 8 U.S.C. § 1436 ("A person not a citizen who owes permanent allegiance to the United States, and who is otherwise qualified, may, if he becomes a resident of any State, be naturalized upon compliance with the applicable requirements of this subchapter....") (emphasis added). ^ a b 8 U.S.C. § 1427(a) ("Requirements of naturalization"); see also 8 U.S.C. § 1429 ("Prerequisite to naturalization; burden of proof"); 8 U.S.C. § 1452 ("Certificates of citizenship or U.S. non-citizen national status; procedure"); 8 U.S.C. § 1503 ("Denial of rights and privileges as national"). ^ a b "Justice Department Seeks to Revoke Citizenship of Convicted Felons Who Conspired to Defraud U.S. Export-Import Bank of More Than $24 Million". Office of Public Affairs. U.S. Dept. of Justice (DOJ). May 8, 2018. Retrieved 2019-01-18. See also, generally United States v. Lefsih, 867 F.3d 459 (4th Cir. 2017); Saliba v. Att'y Gen., 828 F.3d 182 (3d Cir. 2016); Al-Sharif v. United States Citizenship and Immigration Services, 734 F.3d 207 (3d Cir. 2013); In re Petition of Haniatakis, 376 F.2d 728 (3d Cir. 1967). ^ "La cittadinanzaitaliana" (in Italian). integrazionemigranti.gov.it. Retrieved 12 July 2018. ^ "Indonesia's New Immigration Law Confuses One and All". Jakarta Globe. Archived from the original on 2012-06-03. Retrieved 2012-06-15. ^ "Malaysian Citizenship Requirements". USA Today. Retrieved 25 January 2017. ^ "Application to Renounce Malaysia Citizenship". Ministry of Foreign Affairs, Malaysia. Retrieved 25 January 2017. ^ "Application For Citizenship Under Article 19 Of The Federal Constitution – Aged 21 Years And Older". Malaysian National Registration Department. Archived from the original on 25 January 2017. Retrieved 25 January 2017. This is application for Malaysian citizenship by naturalisation. ^ "Constitution of Malaysia 1957". CommonLii. Retrieved 25 January 2017. ^ The Administrative Naturalization Law of 2000, Chan Robles Law Library, 8 June 2001, retrieved 2006-12-19 . ^ Rules and Regulations Implementing Republic Act No. 9139, Chan Robles Law Library, retrieved 2006-12-19 . ^ a b "South African Citizenship Through Naturalization." Immigration Assistant. N.p., 21 July 2009. Web. 1 Dec. 2011. ^ Doug Coulson, Race, Nation, and Refuge: The Rhetoric of Race in Asian American Citizenship Cases (Albany: SUNY Press, 2017). ^ "Ligjet.org - Për shtetësinë shqiptare". ^ "Afers Exteriors - Govern d'Andorra". ^ Manby, Bronwen. "Citizenship Law in Africa: A Comparative Study" (PDF). Open Society Institute, 2010. Retrieved 2013-07-02. ^ Ko, Swan Sik (1990). Nationality and international law in Asian perspective. London: Martinus Nijhoff Publishers. ISBN 0-7923-0876-X. ^ United Nations High Commissioner for Refugees. "Refworld - Barbados Citizenship Act, Cap. 186 (last amended 1982)". Refworld. ^ Government of Barbados (30 November 1966). "Barbados Citizenship - CAP186". Immigration Department. Retrieved 3 July 2010. ^ "Национальный правовой Интернет-портал Республики Беларусь". ^ United Nations High Commissioner for Refugees. "Refworld - Bhutan Citizenship Act, 1985". Refworld. ^ "Brazilian Laws - the Federal Constitution - Individual and collective rights and duties". ^ "Lex.bg - Закони, правилници, конституция, кодекси, държавен вестник, правилници по прилагане". ^ United Nations High Commissioner for Refugees. "Refworld - Burkina Faso: Code des personnes et de la famille". Refworld. ^ Tribunal Supremo de Elecciones. "Naturalización por residencia" (PDF). tse.go.cr. Retrieved 9 April 2018. ^ "Zakon o hrvatskom državljanstvu". ^ Riina Kindlam. "Citizenship". Archived from the original on 2010-08-27. Retrieved 2010-08-20. ^ "Code of Greek Citizenship (Part 1)". ^ United Nations High Commissioner for Refugees. "Refworld - Hungary: Act LV of 1993 on Hungarian Citizenship". Refworld. ^ "Icelandic Nationality Act". Ministry of the Interior. ^ "Landesverwaltung Liechtenstein". www.llv.li (in German). Retrieved 2017-10-22. ^ "Migration Department - Granting of Citizenship of the Republic of Lithuania through Naturalisation". ^ "Monaco citizenship requirements". Archived from the original on July 15, 2014. ^ "IND Verblijfwijzer". Archived from the original on 2008-03-28. Retrieved 2010-05-15. ^ "Institucional - Dirección General de Migraciones". ^ Lei Orgânica 2/2018, a statue from July 5, 2018. ^ "Romanian Citizenship · Romanian Passport". ^ "Samoa Immigration > Citizenship Services". Archived from the original on 2012-09-28. Retrieved 2014-07-14. ^ "Pages - Spanish Nationality". ^ ""Nationality Act, B.E. 2508" (PDF). Royal Government Gazette Vol. 129, Chapter 28. refworld.org. March 21, 2012. Sections 10-12. ^ Kamal Sadiq (2 December 2008). Paper Citizens: How Illegal Immigrants Acquire Citizenship in Developing Countries. Oxford University Press. pp. 49–178. ISBN 978-0-19-970780-5. ^ Nigel (16 August 2013). "'Mustapha Bertanggungjawab Ubah Demografi Sabah'". Sabah State Government (in Malay). Kudat Town Board. Archived from the original on 1 June 2016. Retrieved 1 June 2016. ^ Faisal H. Hazis (2015). "Patronage, Power and Prowess: Barisan Nasional's Equilibrium Dominance in East Malaysia" (PDF). Universiti Kebangsaan Malaysia. Universiti Sains Malaysia. pp. 15/24. Archived from the original (PDF) on 19 June 2016. Retrieved 19 June 2016. ^ Mark Rockwell (2018-01-12). "DHS pursues cases exploiting biometric data gaps". fcw.com. Retrieved 2018-08-31. ^ a b "Has the Trump Administration Launched an Immigrant 'Denaturalization' Task Force". snopes.com. 2018-07-12. Retrieved 2018-08-31. ^ Jeff Mordock (2018-01-09). "For first time, Justice Dept. yanks naturalized citizenship in new 'Operation Janus' crackdown". Washington Times. Retrieved 2018-08-31. ^ François Masure, "Etat et identité nationale. Un rapport ambigu à propos des naturalisés, in Journal des anthropologues, hors-série 2007, pp. 39–49 (see p. 48) (in French). ^ "Advice about Possible Loss of U.S. Citizenship and Foreign Military Service". United States Department of State. Archived from the original on February 2, 2011. Retrieved February 5, 2019 – via travel.state.gov. ^ "The Sovereign Citizen | Patrick Weil". www.upenn.edu. Retrieved 2018-07-05. ^ For a comparative analysis of modes of loss of citizenship of 30 European states, see De Groot, G.R. and M. Vink (2010). "Loss of Citizenship: Trends and Regulations in Europe" Archived 2012-03-02 at the Wayback Machine. Comparative Report RSCAS/EUDO-CIT-Comp. 2010/4. Florence: EUDO Citizenship Observatory, pp. 52. ^ "Ottawa revoking citizenship of more than 3,000 after fraud investigation". The Globe and Mail.